Sky News has been fined £50,000 for a report aired during the Iraq war which included fake footage. The Independent Television Commission (ITC) said the channel had breached accuracy rules by passing off a missile launch test as footage of real combat. 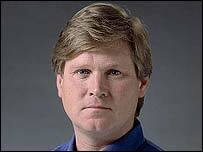 Reporter James Forlong, who was 44, committed suicide after claims went public that he faked his Iraq report. The ITC praised Sky for not seeking to evade the importance of the error, and calling it an isolated incident. The report in question purported to show a cruise missile being fired at Iraq by HMS Splendid from beneath the Persian Gulf. A BBC documentary later revealed filming had taken place when the submarine was in dock, while the missile launch was taken from archive material. The ITC concluded the report had not been presented with due accuracy as the commentary implied the firing of the missiles was part of the hostilities. The commission said that while reconstructions were permitted in factual programmes, they must be cleared labelled as such. The ITC said it accepted mitigation that Sky had relied on a experienced and usually accurate reporter, and the particular security restraints imposed by the military during filming. It also added that it was the only time Sky News' reporting was called into question during the war. Mr Forlong, who had worked at Sky for 10 years, resigned from his job when the news of fake footage emerged, apologising for a "lapse in judgement". But he was found dead at his home in October, a coroner ruling it was suicide.